Hi! Welcome back! Today I am playing along with this week’s Global Design Project Sketch Challenge – #GDP042 – using the new Best Birds bundle. I sponged the sunset by creating a circle mask the same size as my card front – makes it easy to line up and achieve the look I wanted. The circle template is made using the largest circle in the Layering Circles framelits. The bird and branch were first inked using markers directly on the stamp – and then shaded in using a blender pen and ink pads. I like that I was able to get the details from the outline but still add muted color using the blender pen. 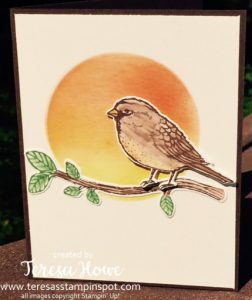 Beautiful card Teresa and perfectly designed for the sketch challenge! Thanks so much for sharing your talents and joining in with this week’s Global Design Project! Beautiful. The sponged circle really brings this bird to life. Love it! Thanks so much for playing along with this week’s Global Design Project sketch challenge! This is perfect for the layout sketch! Great job!! Thank-you for playing along with the Global Design Project.